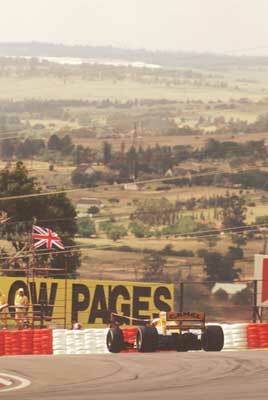 South Africa continues to hope for a return to the Formula 1 calendar. In principle there should be a South African Grand Prix in 2001, following an agreement between Formula 1 boss Bernie Ecclestone and South African President Nelson Mandela in August 1998. Under that agreement Ecclestone agreed to send teams to tests in South Africa in 1999 and 2000 and promised that South Africa would get a slot in the calendar in 2001 if everything was in order. The problem for the South Africans is that the rand has continued to slide in value against the dollar, making the race more and more expensive as time passes. Time has not, however, dulled enthusiasm for the sport and at the F1 test in Kyalami last February 25,000 people turned out to watch three cars in action. But while is has long been assumed that any new South African GP would be held at Kyalami, in the northern suburbs of Johannesburg, a new facility called Phakisa Freeway is beginning to make its mark. The Formula 1 Race Director and Safety Delegate Charlie Whiting recently visited Phakisa to check if the circuit has the necessary safety standards to be granted a Formula 1 testing licence and there is little doubt that the Phakisa authorities are aiming to hold the Grand Prix in the future. The Automobile Association of South Africa, which owns Kyalami, is clearly aware of the threat and recently AASA motor sport boss Selwyn Nathan proposed that any future South African GP should alternate between the two facilities. Kyalami's problems stem from two factors: it is now surrounded by the suburbs of Johannesburg and is facing increasing restriction of the noise levels and development. In addition Johannesburg is not as attractive to F1 as once it was because of the increase in violent crime in the city, which has begun to invade even the richest suburbs of the city. Phakisa has no such problems. It is located out in the countryside and the sleepy town of Welkom has little crime. The problem is that there are no major hotels in which to house the visiting Formula 1 circus. Welkom is 140 miles south of Johannesburg and 100 miles north of Bloemfontein. It was established in 1948 by the gold mining baron Sir Ernest Oppenheimer and aside from gold mines had little to commend it. With the drop in the price of gold in recent years there have been problems in the South African goldfields and 80,000 jobs have been lost. Faced by this disaster the Free State Legislature decided to try to create a tourist trade in the region. They aimed to turn Welkom into "The City of Gold" but without scenic hills or rivers this was not going to be an easy task. And so the state government decided to use sport as a catalyst and established the Phakisa Sport Events and Development Corporation. The old salt pans around the city have been turned into watersports facilities and nature reserves, the St. Helena gold mine has been turned into the world's deepest wine cellar and the old Oppenheimer Golf Course is now the home of the South African Masters golf tournament. The most important element in the revitalization of the region was the reconstruction of the old Goldfields Raceway. The government raised $16.5m and turned it into an international-standard, multi-purpose sports facility and racing circuit. It has an oval track and a road course and also features a stadium which is home to the local football team - the Qwa-Qwa Stars. Thousands of jobs were created in the construction industry and Phakisa recently hosted the South African Motorcycle Grand Prix, a round of the FIM 500cc World Motorcycling Championship. The use of motorsport to promote the region should not be unexpected in that the Phakisa Sport Events and Development Corporation is being run by Bobby Hartslief who was, in the late 1970s, the race promoter at Kyalami. "The owners at Kyalami need to face the sad reality that motor racing is a noisy sport and racetracks just don't exist in built-up areas," Hartslief said recently. "There will come a time when the value of the land will be more valuable than the return they get from motor racing." As Welkom develops its tourism industry hotels will be built and it is convenient that Tomas Scheckter, the son of 1979 World Champion Jody Scheckter, is showing potential which could get him into F1 within a few years.